How do I delegate site access to a user? Sakai Community DocumentationSakai 11 - EnglishSakai 11 Administrator Guide Delegated AccessHow do I delegate site access to a user? Go to Delegated Access tool. Select Delegated Access from the Tool Menu of the Administration Workspace or in your own My Workspace site. Enter the user name or user ID and click Submit (or hit "enter" key). Click the Edit link for the user. Tip: You can also search for a user by clicking the Search by Access button. See How do I search users in Delegated Access? 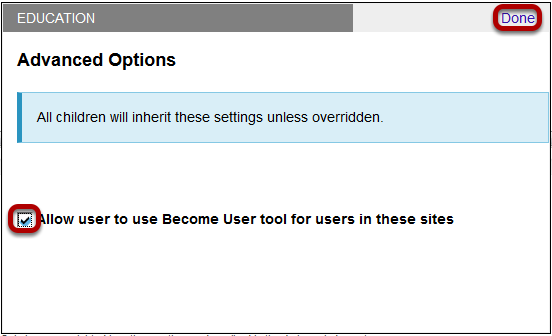 If you want to provide the user with admin capability for all hierarchy nodes, you can skip this step. Otherwise, click the Expand All Nodes link (or click the root node). Continue expanding nodes to access the appropriate node. Note: Settings you select for a node will apply to all its "child" (lower-level) nodes, but not to any other nodes at the same level in the hierarchy. You can always override settings that a lower-level node inherits from a higher node. Select a role from the User Becomes menu. The user will have the permissions for the selected role when accessing sites. 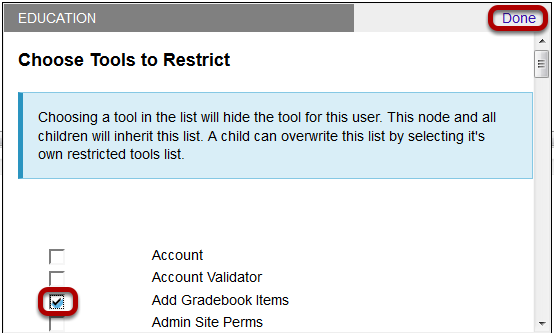 If you would like to restrict access to specific tools within a node or site, click Restricted Tools. Select the tool/s you want to restrict, then click Done. If you would like to enable access to the Become User tool, click Advanced. Enable Become User tool, then click Done. In the window that displays, enable the Allow user to use Become User tool for users in the these sites setting. Then, click Done. The Become User tool will be added to the user's system landing page. Note: The Become User tool will only function for the sites to which the user has been granted access. Click Save. A "Successfully saved" message displays. If the user has no previous delegated access permissions enabled, the Delegated Access tool gets added to the user's My Workspace, along with Become User if you also enabled access to that tool. Prev: How do I let a non-admin manage shopping period access? Next: How do I edit user permissions in Delegated Access? What is the Admin Site Perms tool? How do I add site role permissions for all sites? How do I remove site role permissions for all sites? How do I log in as another user? How do I view user info? How do I let a non-admin manage delegated access? How do I let a non-admin manage shopping period access? How do I edit user permissions in Delegated Access? How do I remove user permissions in Delegated Access? How do I search users in Delegated Access? How do I access a site via delegated access? How do I set a shopping period? What is the Email Templates tool? How do I edit an email template? How do I add a new email template? How do I make an LTI 1.1 tool available to site owners? How do I add an LTI tool to a site as an admin? What is the Job Scheduler? How do I view the event log? How do I filter events? How do I view jobs? How do I schedule a new job? How do I delete a job? How do I view running jobs? What is the admin Memory tool? How do I view Memory Status? How do I locate maxed out caches? How do I reset all caches? How do I evict expired members? What is the Message Bundle Manager tool? How do I find the number of modified messages in the system? How do I search system messages? How do I view system messages by module? How do I customize a default system message? How do I view and edit modified messages in the system? What is the Online tool? How do I view active servers? How do I view user locations? How do I view active sessions? How do I refresh location, session, and server data? What is the PA System? How do I create a banner system message? How do I edit a banner system message? How do I delete a banner system message? How do I create a popup system message? How do I edit an existing popup system message? How do I delete a popup system message? How do I search Realms? How do I modify an existing role within a Realm? How do I create a new, or custom role within a Realm? What Resources are specific to admin users? What is the Site Archive tool? How do I export/archive an individual site? How do I batch export or archive multiple sites? How do I download archive files? How do I import an individual site archive? How do I batch import multiple site archives? What is the Sites tool? How do I search for a site using the Sites tool? How do I edit a site using the Sites tool? How do I Soft Delete a site from the Sites tool? How do I add a stealthed tool to a site? How do I view reports for a specific site? How do I create predefined reports available throughout the system? How do I view server-wide reports? What is the Users tool? How do I add a new account? How do I create multiple new user accounts by importing a file? How do I search for a user account? How do I edit a user account? How do I disable a user account? How do I remove a user account? How do I search for an account in User Membership? How do I filter search results in User Membership? How do I make a user active in multiple sites? How does Worksite Setup differ for admin users? How do I restore a softly deleted site? How do I Hard Delete a site?